Asthma is an ailment of the lungs that manifests in sudden attacks that can be quite horrifying for the sufferer. These attacks are triggered by inflammation of the throat and lungs, and are characterized by difficulty breathing, coughing and can even lead to death in cases when treatment is not administered on time. As if that wasn’t enough, conventional asthma treatments like rescue and steroid inhalers can be so expensive that some sufferers are unable to afford them. However, if emerging research is anything to go by then cannabis asthma treatment could be the most effective yet accessible asthma treatment that everyone’s been waiting for! When most people first hear about the possibility of cannabis being an effective treatment for asthma, their initial reaction is to laugh it off as a joke. This is an understandable reaction when you consider that asthma is a respiratory disorder so it kind of seems counterintuitive to recommend inhaling cannabis smoke to treat it. The truth is that there are many different of ways to consume cannabis aside from smoking it. Nowadays, we have cannabis-infused edibles in the form of candies, cookies and chocolates, as well as vaporizers and tinctures that asthma patients can use to take cannabis without irritating their lungs. In addition to keeping your lungs safe from harmful smoke inhalation, edibles actually allow you to consume a higher dosage of the THC compound, and it reaches the bloodstream faster to give you a quick but lasting relief. As mentioned, the main cause behind asthma attacks is inflammation of the throat and lungs. Thanks to its powerful anti-inflammatory properties, the cannabis plant fights this disease from the source. Plus research shows that the THC compound within the cannabis plant is able to open up the airways so that you can breathe easier and deeper. In fact, results from a 1973 study indicate that THC can clear up the airways by up to 40% and you don’t even have to consume it in large dosages in order to experience these benefits. The same study shows that marijuana smoke interacts very differently with the lungs when compared to cigarettes and opiates. Instead of obstructing the lungs through bronchoconstriction like cigarette smoke does, cannabis smoke actually causes bronchodilatation which refers to opening up of the lung pathways to make it easier for you to breathe. For the skeptics who’ll argue that this study is outdated or insufficient to make conclusions on the efficiency of cannabis to treat asthma- you’re right. However, there’s no denying that the study offers several first-person accounts of asthma patients whose symptoms were significantly alleviated through the use of cannabis. You also have to keep in mind that cannabis is a well-known anti-inflammatory powerhouse, and as such has been used to effectively treat ailments like extreme forms of epilepsy, chronic pain, cramping, and even brain trauma. 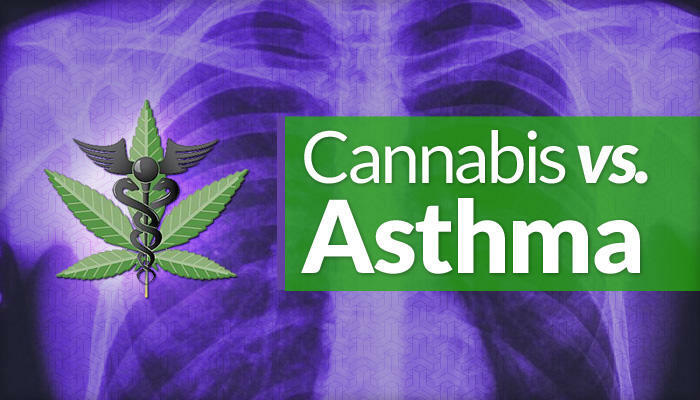 Cannabis asthma cure is just another in a long list of conditions whose symptoms can be significantly alleviated by using cannabis. Next PostNext How to Make a Gravity Bong?